This is one of the most simple lobster recipes - you don't need a lot and if you've got a bit left over, it's well worth using it here. Or you could cook an extra lobster and prepare it (cook, dress and freeze) until you're ready. A very simple meal but full of flavor. ***If you want your Lobster Stuffed Skins With a little kick, add cayenne pepper or hot sauce to taste. (1) Steam lobster for approximately 1/2 to 2/3 the normal steaming time, approximately 7 1/2 minutes to 10 minutes. 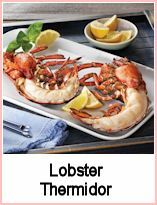 (Regular time to fully steam a lobster is about 15 minutes per pound for the first pound, and about 5 minutes per pound for each additional pound thereafter.) Then, separate the claws and tails and remove the lobster meat and cut into small chunks. (2) Bake the potatoes for approximately 45 minutes until tender. (3) After potatoes have cooled, scoop out the center of the potato leaving about 1/4 of an inch around the inside of the skin and set aside. (4) Take a large frying pan and melt some of the butter (2 tablespoons) and toss in the chopped onion until tender. (5) Add the lobster meat and stir until fully cooked and remove from heat. (6) Add the potato you scooped out of the center as well as the rest of the butter. (7) Add the cheddar cheese, sour cream, parsley and milk. ***If you're adding hot sauce or cayenne pepper add it now. Place potato skins in a baking pan and generously fill the potato skins with the mixture. 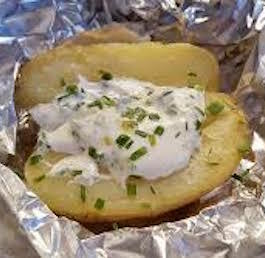 Bake until hot and top with some more sour cream and chopped herb - dill, parsley or chives. 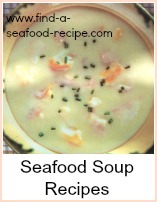 The Seafood Soup Recipes link goes through to my book - 50 Fish and Seafood Soups - you can get this free in 5 parts via email if you subscribe to Seafood Recipe News. 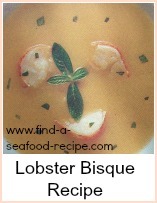 In the book, there is a recipe for a Frugal Lobster Bisque, which uses the shell only - check it out. This Lobster Loaded Potato Skins recipe is one of the most simple lobster recipes.